The TBR Challenge has been kicking around Romancelandia, in one guise or another, for a number of years. I took over hosting duties in 2011 and have decided that, once again, I'll bring the challenge back for 2015. 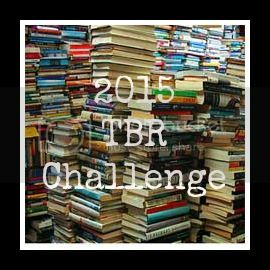 What is the TBR Challenge? Simply put, it's where readers pick up a long neglected book from their TBR pile, read it, and comment on that read on the 3rd Wednesday of every month. The idea is to read those long neglected books that you just had to get your hands on at the time, but have been languishing in your pile, all lost and forgotten. Why do I make you do "homework?" Honestly? Because it's fun. Over the years many people have commented how much they enjoy following along with the TBR Challenge participants to discover "long lost gems" and maybe get a different perspective on a book they read years ago. Plus is the one day every month where you are guaranteed to get some good book chatter. This is a voluntary challenge and I want it to be fun. Which means if you skip a month (or, uh, several), I'm not going to publicly shame you. Hey, life happens. Even to the best of us. Also, I am keeping up with the tradition of providing monthly themes. Some participants like that added focus. Some prefer to go "off theme" and read wherever their mood takes them. And both are perfectly and totally acceptable! The goal of this challenge is to read neglected books out of your TBR, whatever they may be. I take sign-ups for the challenge year round - so if you don't get on board in January, it's not too late. I hope to see plenty of veterans back and a hearty round of newcomers! All aboard! I plan on participating in this challenge, but I do not post anywhere except as a commenter on a couple of blogs. But for sure, I will be trying to pare down that TBR and using this list to do it. Thanks. I'm in for my... 3rd or 4th year? I think for the last 2, I haven't missed a month - go me! And my print TBR pile is significantly more manageable now. Willaful: Your link as been added to the info page. I'm glad you're participating again next year! I'm going to try to take a page out of your book this next year and focus solely on my print TBR for this challenge. We'll see how that goes though. Sometimes I get "under the gun" and end up having to read a novella out of the digital TBR to meet my own deadline! I've seen this around for a few years and I am ready to join! My print TBR shelf has gotten out of control and I need help. I will be posting at my blog: http://feministfairytalereviews.blogspot.com/. Can't wait to start looking for books to fit the themes, that is actually the fun in it for me! Jennifer, Keira, Phyl, Miss Bates and Sonia - I've got your links added to the information page! Happy to see the rest of you back for another year! Sounds fun! I'm not a blogger but would love to join the challenge. Zannerina: And I've got you added to the information page! Thank you for joining. I want to address my print TBR as well. Thanks for the idea. I've started a new inner circle! We can call ourselves the Printettes. Hmmm, I think my comment got eaten. Apologies if this double-posts. I'm in! Jill: Nope, no double comment! I've added you to the information page. Thanks! I will join again, striving to do better. AL: ::waving:: I've got you added! Thanks! Thank YOU, m'dear, for keeping this wonderful challenge going. Sounds like fun. I may not be able to complete all months, but I would like to try. Thank you for coordinating this challenge! MFOB: We're pretty loose with this Challenge. Some months you can. Some months you can't. Life being life and all. I'll be keeping track on my blog: http://backporchervations.blogspot.com. I'm not sure I have a book for each month's theme, but will follow along where I can. Christine: ::waving:: Glad you're back! LOL - hey, at least my challenge will get you to blog once a month, right? Hi Wendy. Happy New Year! I'm also pushing the reset button and will be joining all of you again in 2015. I'm planning on participating as well for the first time. My blog is http://samsbookblog.blogspot.com. Thanks! Samantha: Welcome aboard! I've got you added. Hi Elaine! I've got you added. Thanks! Book Dragon: I've got you signed up! Thanks for joining!